Abstract: Robust and portable high capacity storage is the goal of just about anyone with more then one computer. This is one solution, does it work? 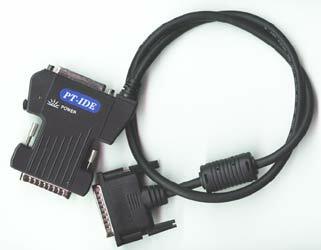 The IDE/parallel interface cable is about three feet long, and hooks up to the parallel port of the hosts' computer through a special IDE port on the backside of the Flip Disk. As this adapter cable blocks the parallel port during use, a passthrough for a printer cable is integrated within the device. A power 'on' LED also displays the status of the device during use. I only have one issue with this adapter and that is I had a difficult time screwing in the connector stays, as they are slightly recessed, and the thumbscrews are too small in diameter. The IDE connector on the back side of the Flip Disk enables the device to be attached to a parallel port via a specialized adapter cable with printer pass through. The drive installs easily into any laptops' PCMCIA port or via the IDE/parallel adapter cable. On our 366Mhz Acer running Win98 we simply plugged in the PCMCIA adapter from the FlipDisk and waited a few seconds for the computer to recognize the new device, load the drivers, and enable the device. The only hiccup that can occur when installing the Flip Disk to a PCMCIA port occurs when there are too many active devices. In our situation we had to disable an infrared port before we could use the drive properly. Similar installation procedures accompanied the IDE/parallel adapter cable. The sample we were sent came with disks that were mislabeled incidentally. With the device attached, an installation utility installed the device to the computer. In this instance a short restart and initializing a "device attach" utility were all that we had to do to access the drives. We ran a few benchmarks on the Flip Disk to gauge how it performed in both PCMCIA and parallel form. While its performance when connected via PCMCIA was slow but acceptable, we found that it performed below tolerable levels when using the parallel cable adapter. *the 4Gb drive is partitioned into 2Gb sections.